The strike of West Virginia teachers and school service personnel ended Tuesday after the state senate finally agreed to a 5 percent pay raise. Although the pay raise had been announced a week previously in a deal reached by Governor Justice and the leaders of the teachers’ unions, state senate leadership proved to be the major roadblock to actually passing the bill. The strike almost ended Saturday evening in a comedy of errors when the state senate voted to pass the wrong version of the bill, accidentally approving a 5 percent pay raise rather than the 4 percent leadership had intended to pass. Senate leaders then appeared to violate their own parliamentary rules to un-pass the bill, in a late-night session that one Democratic senator referred to as “chaotic and somewhat incompetent” and another as “a shitshow.” The senate ultimately passed a 4 percent pay raise, meaning that the bill would go to a conference committee. The conference committee was appointed late Saturday night but did not schedule its first meeting until late afternoon on Monday. News of the senate’s vote, and their mishandling of the process, spread like wildfire on social media. On Monday, thousands of teachers and service personnel from around the state again descended on the capitol. People waited in security lines at the two public entrances to the capitol for hours and many were ultimately unable to get in, as capitol security closed the building to visitors at 1 PM. With national attention increasing and little sign that teachers and service personnel were losing energy, the conference committee reached an agreement Tuesday morning on a 5 percent pay raise — for all state employees, not just school employees. The bill to raise pay for school employees and state police passed both houses of the legislature and was signed by the governor. The pay raise for the rest of state employees would be taken up in the state budget bill, which has yet to pass. Senate Republican leadership emphasized that they had only agreed to the pay raise because there would be budget cuts, including cuts to Medicaid, to pay for it. The senate then amended and passed a budget bill that included the pay raise for non-school public employees and the promised cuts (though, somewhat surprisingly, seemingly not for Medicaid). The budget bill still needs to go through the House of Delegates and it is likely that further changes will be made. Teachers and school service personnel returned to work on Wednesday. But it is not over. While the national media, governor, state legislature, and even union leaders — indeed, everyone except the rank-and-file school employees — have done their best to give the impression that the strike was primarily about pay, in fact fixing the underfunded Public Employee Insurance Agency (PEIA) was a driving force (arguably the driving force) behind the grassroots momentum for the strike. In the early days of the strike, teachers and school employees at the capitol chanted “severance tax!” as they demanded a new source of revenue for PEIA. After Governor Justice struck a deal with union leaders on the fourth day of the strike for a 5 percent pay raise and a task force to study PEIA, many rank and file were frustrated that PEIA appeared to be put on the back burner. The last week of the strike focused on passing the pay raise bill because there was no longer any clear avenue for pushing forward demands around PEIA. But with the governor’s task force on PEIA required to hold hearings this year in all fifty-five counties, there will be many more opportunities for rank-and-file organizing. The strike has energized a huge base of teachers, service personnel, and state employees to continue the fight around PEIA. The director of PEIA has estimated that the program requires at least $50 million a year in additional revenue to keep benefits as they are. That means that over five years, PEIA will require $250 million more than it currently does. Even if West Virginia did not have a legislature committed to corporate tax breaks, this would put a strain on the state budget — and, indeed, the underfunding of public employee health insurance is not a problem unique to West Virginia. Labor militancy around this issue could ultimately pave the way for a national Medicare-for-All solution. West Virginia teachers and service personnel have not focused on federal policy yet, but the PEIA issue will not be going away as long as medical and drug costs continue to skyrocket. But for now, West Virginia school employees have achieved a major victory. What was it that made this strike successful? While it was largely lost in the national media narrative, the initial focus on PEIA was crucial to the strike’s success. The 24,000-member Facebook group launched by rank-and-file teachers was called “West Virginia Public Employees UNITED” and it grew membership through initial efforts to turn people out to PEIA Board and legislative committee hearings on PEIA. With one in seven West Virginians on PEIA, fixing the underfunded health insurance program had the potential to — and did — attract a broad base of support. 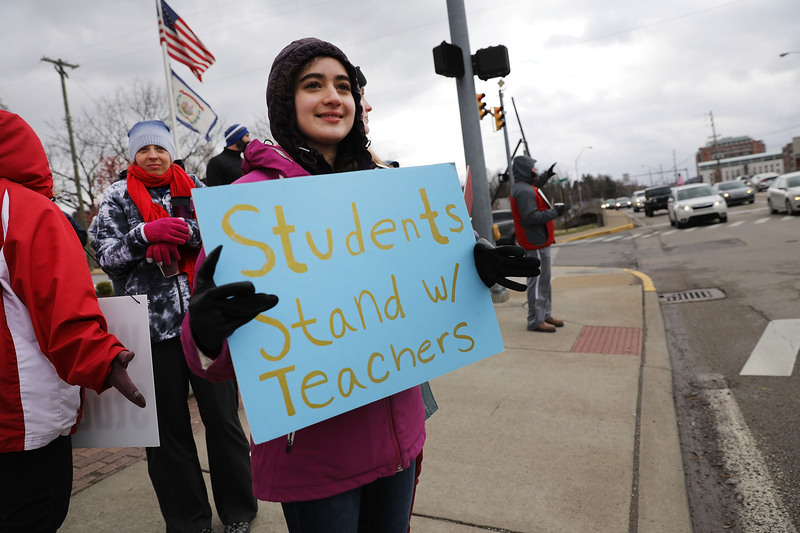 This focus on PEIA likely played an important role in getting and keeping the West Virginia School Service Personnel Association out on strike alongside the teachers. This was a major difference between the 2018 strike and West Virginia’s last teacher strike in 1990, when school service personnel did not participate. Having their support this year was critical, both as a demonstration of unity among school employees and because, without buses running, it would have been more logistically complicated to open schools during the strike. In the end, all fifty-five county superintendents closed schools for all nine days of the strike. Additionally, teachers and service personnel kept the public on their side throughout the strike. Many factors contributed to this, but part of it was the generosity of teachers who largely self-organized to provide food for students who depend on free school meals. Across the state, teachers donated food and worked with churches and other community organizations to make sure kids were fed. This countered an initial attempt by state Republican leadership to feign concern over children’s welfare (even as the House of Delegates passed a bill restricting access to SNAP benefits in the state). The strike also deepened the political understanding of school employees, as rank-and-file leaders made demands not only about funding, but also about where that funding should come from. Teachers and school service personnel demanded a higher severance tax on natural gas to fund PEIA. State senator Ojeda — a populist Democrat who became wildly popular among striking teachers — introduced a bill to raise the severance tax and used every opportunity to go after the coal and natural gas industries that have extracted wealth from West Virginia for decades. While this debate did not result in passing a bill, thousands of school employees learned about the power of the fossil-fuel industries and their influence over key legislators. And, armed with this knowledge, they are now in the position to continue to stand in solidarity with other working-class West Virginians and advocate against budget cuts to fund their raises. West Virginia teachers and service personnel achieved a historic victory. Rank-and-file school employees led a nine-day, statewide wildcat strike that resulted in meaningful concessions from a hostile state government. In doing so, they educated and mobilized thousands of school employees, many of whom had previously paid little attention to state politics. They reminded the nation of West Virginia’s proud union history and challenged unfounded assumptions about what is possible in a “red” state. While they cannot yet declare victory on health care, it is not over.